How do users scan, filter and browse your search results and category pages? Without the right tools, finding just the right product can be an almost impossible task for the user. E-commerce product lists and their filtering and sorting tools determine how easy or difficult it is for the user to browse the site’s product catalog. This is why we at the Baymard Institute have conducted an extensive large-scale usability study of how users scan, evaluate, filter and sort products within a product listing page. A group of users age 21-56 were recruited to test 19 leading e-commerce sites across 8 different verticals. Despite testing multi-million dollar sites, more than 700 usability issues related to product lists, filtering and sorting, arose during testing. All these issues have been analyzed and distilled into 93 concise guidelines on product list usability. From this research study we’ve uncovered exactly what users expect as they interact with product lists on e-commerce sites, what typically goes wrong in the process, why it goes wrong, and what changes e-commerce sites can make to avoid these issues. 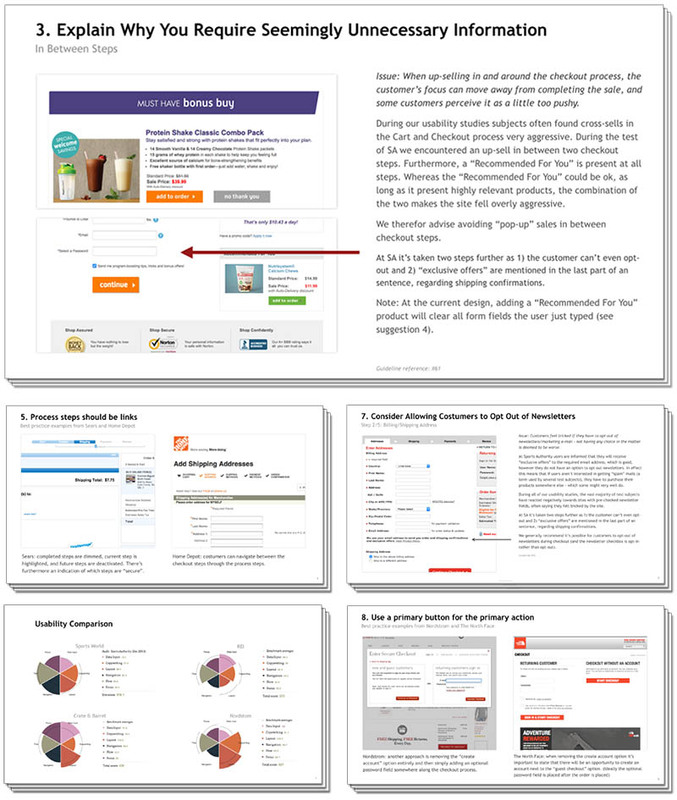 In short: how to design a high-performing product list experience for your users. After all, if users can’t easily browse your product lists, they can’t easily find what they are looking for – and if they can’t find it, they can’t buy it. This page provides you an overview of our research specific to Product Listings & Filtering UX. The product list effectively dictates product presentation and provides the pathway from category pages and search results to the all-important product page. During Baymard’s Product Listings & Filtering study, sites with mediocre product list usability saw abandonment rates of 67-90%, whereas sites with just a slightly optimized toolset saw only 17-33% abandonments for users trying to find the exact same types of product. This translates into as much as a 4-fold increase in leads. With the right filters and a clear filtering interface users are able to narrow down a product list with thousands of generic products to only a few items relevant to their unique needs and interests. 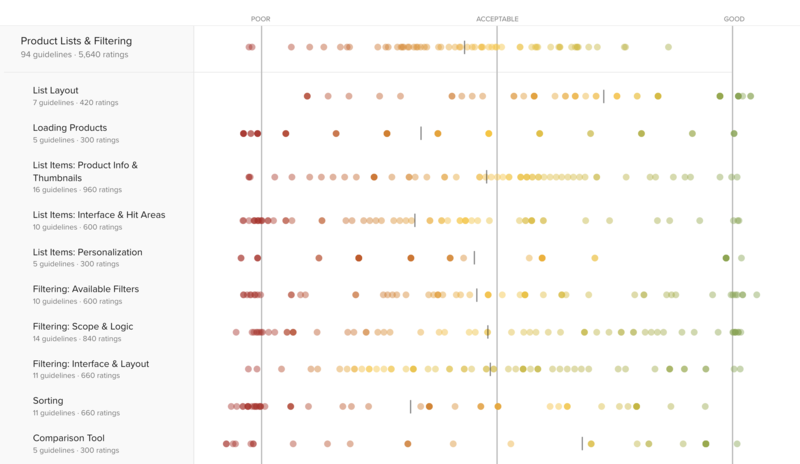 Solid sorting features enable users to order products by the attributes they care about – something that can dramatically speed up the user’s product exploration and selection process. A balanced product list design provides users with a better overview of the products available and help them make a more informed evaluation of which items to engage with (and which they can safely skip). At Baymard we’ve subsequently benchmarked benchmarked the 60 top grossing US and European e-commerce sites twice across all the 94 (weighted) Product Listing guidelines; leading to a massive database of 7840 UX performance scores and 5,600 best- and worst- practice examples of Product List UX. Analyzing this dataset we’ve found the average site to perform mediocre at best, and 36% of sites to have such severe design and feature flaws that it was downright harmful to their users’ ability to find and select products. Product list usability is generally characterized by being both overlooked and poorly understood. On average each site will need to make 35 design changes to achieve optimal product list usability, revealing widespread mediocrity. There’s a clear lack of knowledge about and attention paid to the design and features of product lists. Perhaps most critically, many sites have adopted a fundamentally flawed “one size fits all” approach which greatly impedes the user’s product finding ability. 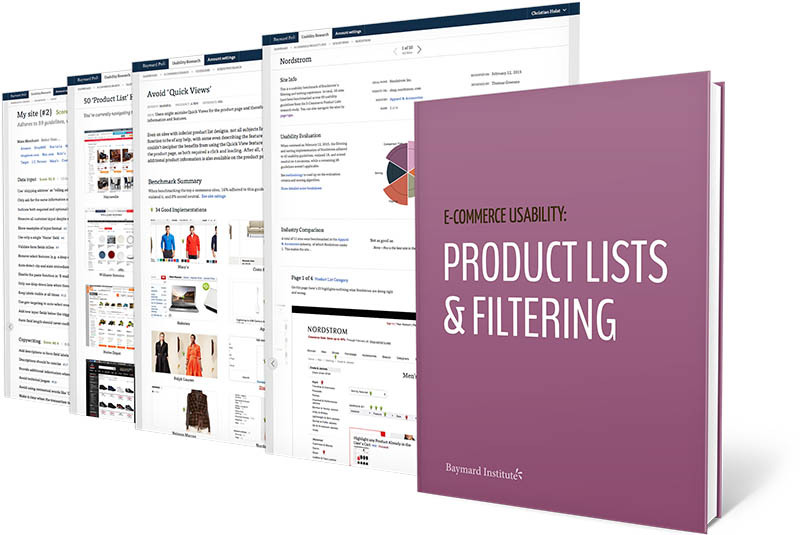 Explore design patterns across 386 page examples of Product Listing, Filtering and Sorting designs and features, all annotated and organized into 4 different categories. This is a great way to get inspiration for your own Product List & Filtering design, and to get a feel for emerging trends in e-commerce. 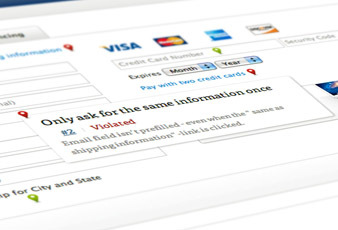 What are the 15 most important changes you can make to your e-commerce filtering and sorting implementation? We will put together a detailed 40-page report of the 15 most important usability improvements you can make to your e-commerce product list design.